Mount Bromo is an active volcano and part of the Tengger massif, in East Java, Indonesia. At 2,329 metres (7,641 ft) it is not the highest peak of the massif, but is the most well known. The massif area is one of the most visited tourist attractions in East Java, Indonesia. 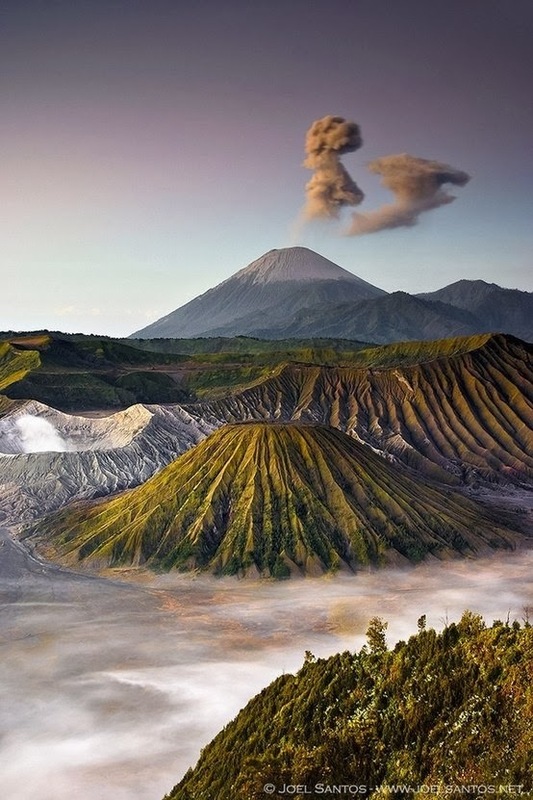 The volcano belongs to the Bromo Tengger Semeru National Park. The name of Bromo derived from Javanese pronunciation of Brahma, the Hindu creator god. Mount Bromo sits in the middle of a vast plain called the "Sea of Sand" a protected nature reserve since 1919. The typical way to visit Mount Bromo is from the nearby mountain village of Cemoro Lawang. From there it is possible to walk to the volcano in about 45 minutes, but it is also possible to take an organised jeep tour, which includes a stop at the viewpoint on Mount Penanjakan (2,770 m or 9,088 ft). The viewpoint on Mount Penanjakan can also be reached on foot in about two hours. From inside the caldera, sulfur is collected by workers.